We are happy to share the news that the data from our weather stations has been integrated in GeoSCAN! The information is one of the most important factors for successful decision making. This is why GeoSCAN now gives you access to even more data about your plants’ growth, thanks to the integration between the crop monitoring program and the Pessl Instruments meteo stations. 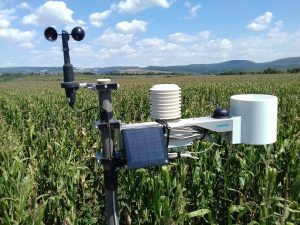 With this new functionalitie farmers can track the information from their local Pessl instruments meteo stations directly in the GeoSCAN platform and compare them with the satellite images and the vegetation index in GeoSCAN. Each subscriber can choose the radius for which they want to receive meteorological data from the Pessl meteo station. current temperature in the field. These reports could be useful in any stage of the crops’ development and will provide farmers with more precise information about the plants’ growth and the potential problem areas in the field. Since September GeoSCAN also provides more frequent satellite images – on average every 4-8 days, which, combined with the meteorological data from the Pessl Instruments stations, allows for accomplishing even more precise crop monitoring.